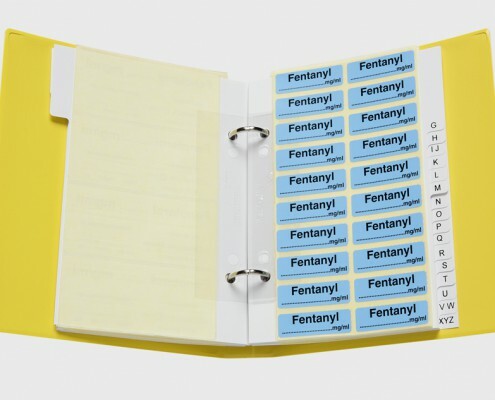 The rescuelabel®Label Book is a new kind of keeping your syringe and syringe pump labels in order, developed especially for emergency medical services. Usually the labels are being produced on rolls or on rolls in boxes which are stored e.g. on the shelves. For emergency medical services such forms of label organization are too bulky to be kept in the emergency vehicles. The rescuelabel®Label Books, on the contrary, fit in every car and can be taken directly to the place of your operation (see the right picture). 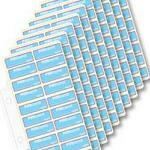 Each label sheet is sorted in alphabetical order, so you can find quickly the label you need. Every Label Book is designed individually to provide only necessary labels. 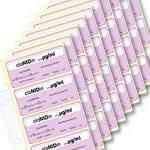 You have a wide choice of different label sheets with syringe and syringe pump labels. 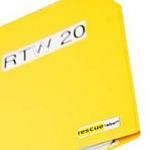 To refill your rescuelabel®Label Book there are refill sets à 10 label sheets available. The labels are in accordance with the recommendation of the German Interdisciplinary Union for Intensive and Emergency Medical Care (DIVI) of 2010 (read DIVI-recommendation 2010, german only) as well as with the ISO Standard 26825. An adjustment on the DIVI-recommendation of 2012 is in process (read DIVI update 2012, german only). The colored labels, labels of new cathegories and single labels are being adjusted at first. As next are the labels with changed spelling on the turn, which will replace old stocks as those will run out. The labels with concentration data, which were not yet in the order list, can be produced in an updated design on your demand. We will inform you about futher time scedule. We produce your Label Book according to your medicine list. Please send us your medicine list together with the information about required amount of Label Books and we will make you an individual offer. We also offer your an index box to store your refill sheets which contains an alphabetical index same as in the Label Book. This index box has space for about 100 label sheets. The rescuelabel®Label Book is a new kind of keeping your syringe and syringe pump labels in order, developed especially for emergency medical services. The rescuelabel®Label books are also well applicable in hospitals and by practicing anesthetists. You can order the rescuelabel®-items also via our order form. Just fill it out and send us back by e-mail or by fax.